For over 60 years, from the Colombo Plan to today’s Australia Awards, the Australian Government has proudly supported emerging leaders from developing countries in accessing a high-quality education and life experience in Australia. Australia Awards remain a central pillar of Australia’s investment in people-to-people links with its partner nations. In South and West Asia, Australia Awards are open to suitably qualified nationals of Afghanistan, Bangladesh, Bhutan, the Maldives, Nepal, Pakistan and Sri Lanka. • support Australia’s public and economic diplomacy agenda. An important area of focus for Australia Awards in South and West Asia is the empowerment of women, and the inclusion of people with disability and individuals from disadvantaged social groups. ‘I have undeniably been provided with a world-class education. I am now confident in best practices in project management and have a greater understanding of how to identify opportunities for change in the Maldives. It was a highly successful and productive year for Australia Awards in South and West Asia. 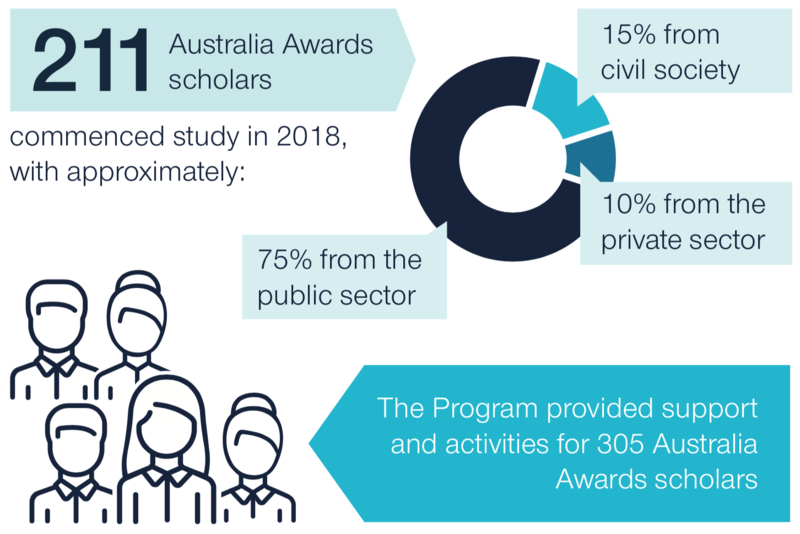 In total, 589 Australia Awards scholars and Short Course recipients undertook tertiary education and training programs delivered by Australian providers in 2017, an increase in throughput of 36 per cent over 2016. All completing Australia Awards recipients, without exception, satisfied the requirements of their study program either to be granted their formal degree or to receive a certificate of completion of their Short Course. All completing scholars and recipients, without exception, returned home on conclusion of their studies. Of particular note was a 75 per cent increase in the number of Short Courses compared with the preceding 12 months. Short Courses were delivered in a broad range of areas aligned to country priorities. Gain scores and participant feedback clearly indicated that these Short Courses were both effective and highly valued by recipients. The number of contactable alumni was increased by 40 per cent over the course of the year—to 4,000. Almost half of this number attended one of the many alumni engagement activities organised throughout the region. ‍Year in Review 2017 presents of the some of the key Australia Awards achievements and landmark events in the region over the course of the year. In South and West Asia, Australia Awards Scholarships offer master’s degree-level study in fields agreed with partner governments and aligned with Australia’s development, economic and public diplomacy priorities. In South and West Asia, Australia Awards Scholarships are available to applicants in Bangladesh, Bhutan, the Maldives, Nepal, Pakistan and Sri Lanka. The study and life experience opportunities provided by Australia Awards Scholarships develop the skills and knowledge of emerging leaders to drive change and contribute to development of their countries. In 2017, 211 Australia Awards Scholarships were offered to successful applicants in South and West Asia for study commencing in 2018. An intensive and targeted promotional campaign attracted almost 2,000 prospective applicants to Information Sessions and resulted in 13 applications being submitted for every available Scholarship. Considerable effort was put into ensuring equity of access to the Scholarships, in line with Australia Award’s Gender Equality and Social Inclusion (GESI) Strategy for South and West Asia. In four of the six participating countries, at least 50 per cent of Scholarships for study commencing in 2018 were awarded to women, and across the region as a whole, women accounted for 48 per cent of Scholarships offered and accepted. 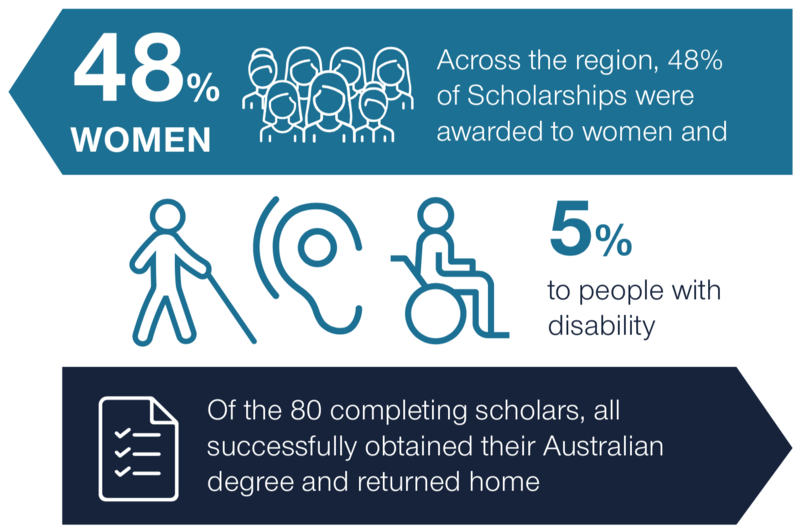 Five per cent of Scholarships were awarded to people with disability. 305 continuing scholars were supported in their ongoing studies at Australian institutions through a range of professional development and networking opportunities. Eighty scholars from across the region completed their studies, obtained their Australian degree and returned home as Australia Awards alumni to contribute to their country’s development. Without exception, all scholars due to complete successfully completed, and all returned home. Return Home Workshops were delivered across Australia for completing scholars to ensure that they were prepared for the transition back to their home environments and focused on their future responsibilities and contributions as alumni. Towards the end of the year, 211 emerging leaders prepared for postgraduate studies commencing in 2018 at world-renowned Australian universities. Australia Awards Short Courses offer the next generation of global leaders for development an opportunity to undertake short-term study, research and professional development opportunities in support of key development and foreign affairs priorities. Short Course opportunities build valuable people-to-people links both with Australia and within the Indo-Pacific region. Of the 495 Australia Awards offered in 2017 across the region, 284 were for Short Courses (57%). Fourteen Short Courses were delivered wholly or partly in 2017, an increase of 75% over the eight delivered in 2016. The design of Short Courses was characterised by strong collaboration between stakeholders. Courses covered a broad range of fields aligned to country priorities. The first regional Australia Awards Short Course for South and West Asia was delivered, providing training on Energy Security to participants from Bangladesh, Bhutan, Pakistan and Sri Lanka, at the Australian National University. The Professional Certificate in International Trade Short Course for Bangladesh led to all participants receiving a postgraduate Australian qualification. Participants reported being highly satisfied or satisfied with their Short Course and all enjoyed their experience in Australia. Pre-/post-course testing indicated that 89% of Short Course participants had acquired additional knowledge and skills during their course. Increased attention on Return to Work Planning influenced a more forward-looking focus in interactions between participants, their supervisors and course providers. Informal Learning Opportunities are an important training modality for Australia Awards in South and West Asia. They are responsive capacity building tools, utilised to provide a variety of opportunities for engagement with partner countries—they can include ad hoc short courses, including on-site training; study tours; workshops; conferences; seminars; work placements; mentoring arrangements; on-the-job training; and the provision of training or capacity building technical assistance. Twenty-three Informal Learning Opportunities were completed in 2017 through Australia Awards in South and West Asia. Ten of these were funded by the Pakistan program, five each by the Bangladesh and Nepal programs, and three by the Sri Lanka program. This volume of activity represents a 50 per cent increase over 2016. These Informal Learning Opportunities encompassed a broad range of professional development activities, including study tours to Australia from Nepal (policing and security in a federalised political system), Pakistan (forensic and judicial processes relating to gender-based violence) and Sri Lanka (observation of smart classrooms). In addition to the above, an initiative was funded by the Australian High Commission in Pakistan to build the capacity of 260 journalists, civil society activists and parliamentarians to raise awareness of malnutrition through advocacy. There was also an initiative to engage Australian experts to travel to Bangladesh and Pakistan to deliver workshops and public lectures, as well as initiatives to sponsor individuals and small groups to attend workshops, conferences and training programs both in Australia and in other locations. Close to 30 inventive Australia Awards alumni from South and West Asia gathered in Dhaka, Bangladesh, in October and November 2017 for the Department of Foreign Affairs and Trade’s ‘Alumni Innovation Challenge’. Globally, alumni of Australia’s education institutions are highly talented, mobile, and equipped with skills and knowledge made possible by their Australian qualifications. They are current and future leaders, influencers and change-makers. In South and West Asia, Australia Awards strives to support strong Australia Awards alumni communities in each country—communities that actively engage with, develop linkages with and promote Australia. In 2017, Australia Awards in South and West Asia put substantial effort into expanding and updating the contact details of Australia Awards alumni stored on the Global Alumni Network database. By December 2017, active email addresses for almost 4,000 alumni had been recorded—an increase of 40 per cent over December 2016. Recently-returned alumni were engaged through Reintegration Workshops conducted across six countries for 175 participants. In 2017 Australia Awards also facilitated 38 country-level alumni engagement events in South and West Asia, attended by 1,700 alumni. The 2017 Regional Alumni Workshop took the form of an Alumni Innovation Challenge, providing grants to enable 35 alumni to pilot a Development Innovation in areas of priority for the Australian Government in their country. In addition to seed funding, grant recipients also received mentoring support. Australia Awards alumni were involved in operations across the region, including assisting with the promotion of Australia Awards; mentoring applicants and new Australia Awards recipients; sitting on shortlisting and selection panels; contributing to Pre-Departure Briefings and Reintegration Workshops; and sitting on interview panels for the recruitment of staff.